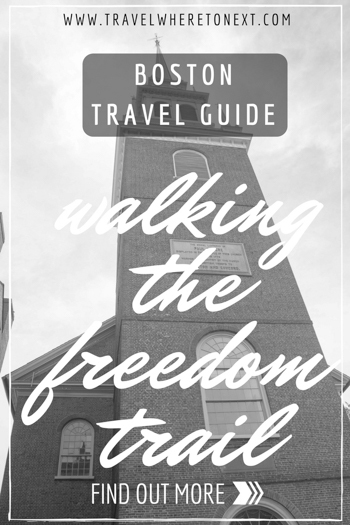 The freedom trail is definitely the most popular thing to do in Boston, and for good reason. The trail is a perfect walk to see all of the famous sights and learn more about US history. Some of our greatest moments took place in Boston and seeing them up close is spectacular. Boston's official Freedom Trail take you to the best sites where US history began! The 2.5 mile trail is marked with a red brick line and is very easy to follow. The Freedom Trail holds a unique collection of museums, churches, meeting houses, burying grounds, parks, a ship, and historic markers that tell the story of the American Revolution and beyond. The trail is mostly outside so you will want to think about the weather before you go. I visited in June and had a fantastic time. The weather was in the 80's with bright and sunny skies. Below is a brief outline of the Freedom Trail along with some facts of each site. Some pictures and facts are transcribed from the Official Freedom Trail website. Visit the website for more in-depth facts of each point. Established in 1634, Boston Common is America’s oldest public park. The church was founded in 1809, the 217 ft. steeple of Park Street Church was once the first landmark travelers saw when approaching Boston. Boston Latin School, founded on April 23, 1635, is the oldest public school in America. It offered free education to boys - rich or poor - while girls attended private schools at home. A mosaic and a statue of former student Benjamin Franklin currently marks the School Street location of the original schoolhouse. The oldest commercial building in Boston, the Old Corner Bookstore was built in 1718 as an apothecary shop and home on property that once belonged to Puritan dissident Anne Hutchinson. Today, the building is being leased and reused by Chipotle. Old South Meeting House was the some of the most dramatic events leading up to the American Revolution, including the meeting that occurred on December 16, 1773. The event that would be known as the Boston Tea Party. Over 30 tons of taxable tea sat in the holds of three ships at Griffin's Wharf. After the failure of a final attempt to have the tea sent back to England, Samuel Adams addressed the crowd, saying, "This meeting can do nothing more to save the country." These words were rumored to be a secret signal to march down to Griffin’s Wharf and destroy 340 crates of tea, dumping them into the harbor. Built in 1713 to house the colony’s government, the Old State House was at the center of civic events that sparked the American Revolution. In 1776, the Declaration of Independence was first read to the people of Boston from the Old State House balcony. Read about the Boston Massacre here. Often referred to as "the home of free speech" and the "Cradle of Liberty," Faneuil Hall hosted America's first Town Meeting. Built around 1680, the Paul Revere House is the oldest remaining structure in downtown Boston and the only home on the Freedom Trail. 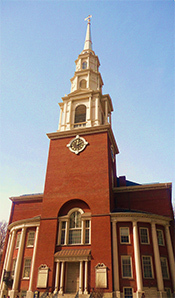 Its 191 foot steeple is the tallest in Boston and, because of its prominence, would play a dramatic role in the American Revolution and would be immortalized in Henry Wadsworth Longfellow's poem The Midnight Ride of Paul Revere. In this church two lanterns were hung for a few moments. It was long enough for patriots in Charlestown to learn what has been immortalized by the phrase "one if by land, two if by sea" in Longfellow’s poem. The British were advancing by boat across the Charles River. Named after shoemaker William Copp, Copp’s Hill Burying Ground is the final resting place and cemetery of merchants, artisans and craft people who lived in the North End. Launched in Boston in 1797, the oldest commissioned warship afloat earned her nickname "Old Ironsides" during the War of 1812 when she fought the British frigate HMS Guerriere.